ENnie Award Nominated for Best Electronic Product! Get in a fight with mall security. The fate of the world depends on it. Temporal Probability Agency takes place in an alternate present day. Since the year 2000, the TPA has been protecting humanity. They've prevented 9/11, wars around the world, and the global financial crisis. Now it's your turn. Agents are selected from the world's population for specific tasks. The computer, Daisy, has done the calculations and knows exactly who has the best chance of success. Sometimes you need to do something small: a spilled beer at the right moment. Sometimes it's something huge: a gunfight with the Italian Mafia inside a burning factory. More information can be found at our website and in our new agent primer! Our adventures have been engineered from the ground up to make them easy to run with little to no prep time. That is what "Print. Pour. Play." means. Print out the adventure. Pour some drinks. Play the game. Encounter Based Design: All scenes are broken down into encounters, even those without combat. New Stat Blocks: Never forget a critical ability during a fight. Plenty of Handouts: Embracing the PDF format has allowed us to provide numerous handouts to draw your players into a scene. Everything you need to know to play TPA is contained in this 25 page PDF. Hindrances, Edges, and Gear for your agent, plus history and background on the agency. It's a quick read so you can get to playing. The players are minding their own business, enjoying a trip home from a tropical vacation, when probability knocks. Take on hijackers a mile in the sky and safely bring the plane to a landing. Get into a fight with Mall Security and steal a bunch of Rolexs. Take on the Italian Mafia to prevent the murder of a labor leader. 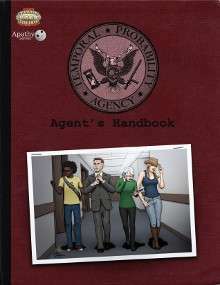 This product includes the Agent's Handbook and the first part of our campaign, To Predict and Serve Act 1: A Function of Probability. This is a ZIP file, so the normal preview is unavailable. You can download a free preview adventure from our website. Temporal Probability Agency requires the Savage Worlds Core Rulebook. I cannot believe that this died on the vine. I payed for the 3 episode pack, only to get the one. Sad! Yeah. I wonder what happened.